Debbie Blicher is Senior Producer of Talkin' Birds. As human population increases, we need more food. To increase food production, we often claim wild grassland and make it into farmland, which means treating it with pesticides, fertilizers, or both. When we treat the land, insect populations diminish and become less diverse, which affects all animals that feed on those insects—including birds. In fact, aerial insectivores—birds that hunt for insects on the wing—are declining across North America. A forthcoming study in The Condor: Ornithological Applications takes a closer look at precisely how Tree Swallows are affected by agricultural practices. In 2012 and 2013, Chantel Michelson, Robert Clark, and Christy Morrissey—all researchers at the University of Saskatchewan—monitored Tree Swallow nest boxes at agricultural and grassland sites. To find out what the birds were eating, they collected blood samples and measured isotope ratios. (Measuring certain chemical elements in tissues is an established way to glean diet data.) Tree Swallows usually eat aquatic insects. Since water receives pesticide runoff, the researchers expected that the swallows living near cropland would be forced to eat more land-based insects than the swallows living near wild grassland. What the researchers found surprised them. The Tree Swallows at both locations ate more aquatic insects than expected. In fact, in 2012 the birds at agricultural sites ate more aquatic insects than the birds at the wild sites. In other words, even though the agricultural sites had been treated for farming, the swallows still preferred the insects there to the insects living by the water. The researchers think this might mean that wetlands provide some cushion for birds against changes brought about by farming. One other surprising finding: The swallows living at agricultural sites weighed less than the swallows living in wild grassland. They were healthy, just smaller, which might mean they had a harder time finding food. But in both locations, adult swallows seemed to rely on aquatic insects for themselves and their young, illustrating the importance of wetlands for bird survival. A new study in Proceedings of the National Academy of Sciences indicates that birds respond like humans do when exposed to constant loud noise. Researchers found that adults and nestlings of three species in the wild showed signs of chronic stress caused by human noise pollution. Most birds exposed to constant loud noise will simply leave an area; this study looked at what happens to the birds that stay. Lead author Nathan Kleist conducted the research while a Ph.D student in evolutionary biology at the University of Colorado-Boulder, along with co-author Rob Guralnick, associate curator of biodiversity informatics at the Florida Museum of Natural History. The research team, led by Kleist, set up 240 nesting boxes at three specific distances from gas compressors on property in New Mexico. The team tested levels of the stress hormone corticosterone in three species: Western Bluebird, Mountain Bluebird, and Ash-throated Flycatcher. The researchers found that the louder the noise from the gas compressors, the lower the birds’ baseline corticosterone levels in all three species. Christopher Lowry, study co-author and stress physiologist at CU Boulder, explains: Although it seems odd that the corticosteroid levels would be low, lab studies of chronic stress in humans have shown that low corticosterone can signal stress so intense that the body has to reduce baseline levels of the hormone to protect itself (so that there's room for it to shoot up if needed). In fact, when these birds experienced sudden stress, their corticosteroid shot up high and came down only very slowly, like it does in chronically stressed humans. In the noisiest environments—the ones closest to the compressors—nestlings had smaller body size and reduced feather development. In Western Bluebirds, the species that showed the greatest noise tolerance, fewer eggs hatched than expected. Since noise at natural gas fields is not unusually loud compared with human noise in many other parts of the country, this study has implications for protecting wildlife and even human health. The researchers suspect that if other species react the way these species did, bird populations could decline if we humans become noisier. Whose Fault is the European Starling? If you live in North America and you love the European Starling, most folks say you can credit Eugene Shieffelin. If you hate the European Starling, they say you can blame the same guy. It's Shieffelin who is largely credited with introducing 60 starlings to New York City's Central Park in the year 1890 and another 40 in 1891. As we all know, they thrived. And thrived. Today, they number around 200 million in North America, with a range all across the continent, and are considered one of the most invasive species on the planet. So if you love them, you can thank Mr. Shieffelin for the huge flocks of noisy, speckled black birds. So how did the American Acclimatization Society come to be? Well, for that we can blame the Société zoologique d'acclimatation, founded in Paris in 1854 by naturalist Isidore Geoffroy Saint-Hilaire. He encouraged the French government to import and breed species that would help feed France and control pests. He encouraged other countries to start similar chapters. By 1877, the American Acclimatization Society was going strong, and Shieffelin, a drug manufacturer from the Bronx, was its chairman. We imagine he must have thought, "How pretty those starlings are! How intelligent and entertaining! What harm could they do?" What harm indeed! They have crowded out countless native North American bird species, interfered with agriculture, and even been a primary cause of airplane bird strikes. Some bad ideas that seem fun at the time are pretty harmless, such as shaving half your beard or adding extra hot pepper to your chili. But importing non-native species? Not harmless. So let's enjoy European Starlings, but let's also try to educate humankind about invasive species so we don't make such mistakes in the future. The fault? Quite simply, it's ours. Before you get worried, we'd like you to know that no owls are harmed in the making of fine California wines. In fact, they get paid well — in rodents. Rodents like to eat grape vines, and Barn Owls like to eat rodents. Many Napa Valley wineries control rodents by putting up nest boxes to establish Barn Owl populations. Researcher Sara Kross from the University of California Davis says that more than 99% of prey items in barn owls’ diets on the farms she studied were agricultural pests — mice, voles, and pocket gophers. Fewer of these pests means easier growing for grapevines. 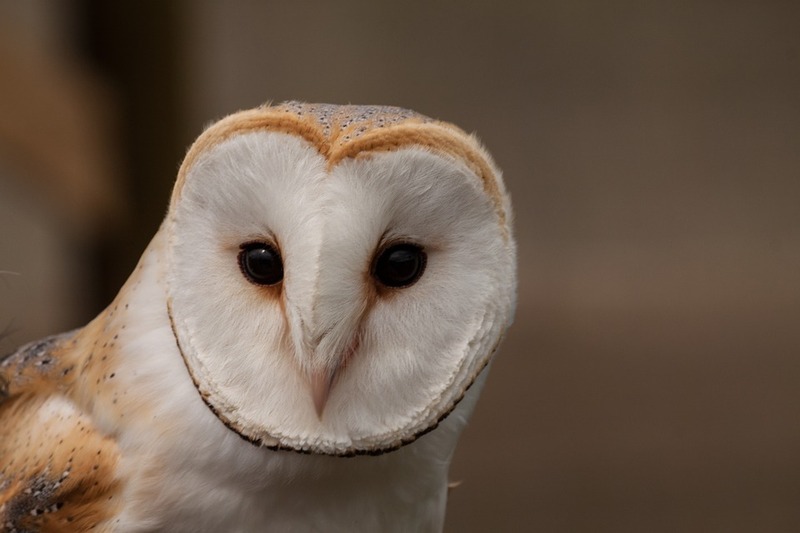 Welcoming Barn Owls allows wineries to reduce or eliminate the use of rodent poisons. It's important to note that, if poisons must be used, they should be used with care, since an owl that eats a poisoned critter will ingest the poison, too. Intrigued? You can read more about Kross's research here, including where to get nest boxes of your own. Wildlife Biologist Carrie Wendt says, "When it comes to wine making, owls are part of the whole process, because they’re rodent-devouring machines." People better at birding by ear than by eye can find it maddening to try to hear songs and calls over traffic noise. We wait for the bird to raise its voice once the rattling trucks have passed--only to discover that someone has fired up a leafblower nearby, drowning out everything the way radio static drowns out music. As annoying as unwanted human noise is to us, it's devastating to other creatures. For example: if birds can't hear one another, they can't alert one another to approaching danger or attractive mates or good food sources. Prey animals can't hear predators in a noisy environment, which means more of them get eaten, affecting the ecological balance. Human noise pollution affects plant reproduction by scaring away birds that help distribute seeds, according to a recent paper in the Proceedings of the Royal Society of London B.
Buxton and McKenna and their team used a model for predicting noise based on sound measurements taken all over the country by the National Park Service. Individual scientists hiked in to more than 400 listening stations to set up the equipment, each of which included a sound level meter and a recorder. Each recorder ran for 30 days, collecting every sound. The recordings were then analyzed by acoustic specialists. The researchers then constructed a model for predicting noise by figuring out which sounds were associated with geographic features such as elevation, annual rainfall, proximity to cities, highways and flight paths. By subtracting out natural sound sources, the scientists estimated the amount of noise pollution for each specific wilderness area. The findings were mixed. Protected areas did show much lower levels of human-caused sound than the "buffer zones” of unprotected land near them, suggesting that these buffer zones really do insulate parks. But 63 percent of the protected areas showed an increase in sound levels of at least three decibels caused by noise pollution. Since decibels are logarithmic, three decibels indicates a doubling of background noise. More than a fifth of protected areas experienced 10 extra decibels of human noise. Sadly, the majority of areas considered “critical habitat” for endangered species were among the regions that dealt with the worst noise. McKenna said that parks are taking steps to reduce human sounds, such as implementing shuttle systems to reduce the number of cars and posting library-style “quiet” signs. But the problem of pervasive traffic sound—all those low-frequency rumbles from ground and air—is not so easily solved. Buxton suggests that parks look into “quiet pavement” to muffle the sounds of rolling tires and establish noise corridors to align airplane flight paths with highways. We here are Talkin' Birds plan to drive as little as possible in protected areas, opting instead for quieter transportation such as foot and bicycle. We'll try to keep our voices down, too. And we would never dream of playing a radio in the wilderness, not even to listen to our own show. We would rather not disturb the symphony of life around us, nor its musicians. Want to listen to a news story on this research? Click here for a piece from NPR's Morning Edition. "Biodiversity" means "the variety of life in a particular habitat." Each life form, from bacterium to towering tree, plays a role in sustaining its ecosystem. Therefore, each life form matters. There are few ecosystems on Earth with more biodiversity than a rainforest. A recent study shows that the loss of even a few species from that rainforest adversely affects its longevity. Although a forest may look healthy, if the creatures required for maintenance are missing, the forest can't regenerate if it's disturbed, and its trees will eventually die out. Research from the Department of Life Sciences at Imperial College London, published in Proceedings of the Royal Society B, shows that intensive land use, such as for agriculture and ranching, often leads to the extinction of local forest birds. These birds perform "biodiversity services" that are necessary for maintaining the rainforest's health, such as keeping down the population of plant-eating insects and dispersing the seeds of tree species. But it isn't just the individual birds species that guarantee the future health of the forest, nor is it the number of species left alive; it's the way these species interact with other kinds of life. The research team studied the composition of bird communities from 330 study sites in the Brazilian Amazon, sampling more than 450 bird species. They also kept track of what special traits these species possessed, such as their beak size and tail and wing shape. (These traits indicate what kind of job a species has evolved to do.) Then they looked at how landscape change affected these bird populations, specifically those birds who eat insects and those who disperse seeds. The results were sobering. When insect-eating birds go locally extinct, leaf-eating insects can prevent young saplings from growing up into mature trees. When birds that eat certain seeds are missing, then the trees that grow from those seeds eventually go missing, too. Next, the team plans to examine the impact of human activity on global ecosystems by using bird traits as a window onto the effects of environmental change. It may seem obvious to say so, but birds have a lot of experience with flight. For long journeys, they tend to take off when the wind is favorable, just after the passage of a low-pressure system, when it's unlikely they'll fly into a hurricane. Sometimes, however, they're caught in the end of a hurricane’s spiral and are then blown toward the eye of the hurricane, where the winds are much lower. Once they get there, they may make an effort to stay there, because flying in that relative calm takes less energy than fighting to get out. In fact, they may remain in the eye until the hurricane dissipates. After a hurricane, most seabirds find their way back to shore quickly if they're not too weakened from flying so long without food. Other birds, however, can require more time to recover and then take several days to return to their usual territory. It is these birds that birders are excited to see as they pass though areas where they aren't usually found. As hard as hurricanes are on individual birds, their habitat feels the effect more. High winds can knock nests out of trees, knock down the trees themselves, and uproot plants that birds use for food sources. For example, hurricane Hugo wiped out 60 percent of 500 groups of birds in North Carolina in 1989, and 87 percent of trees where they lived were destroyed, according to the National Wildlife Federation. If this sounds like bad news, remember that a change in habitat means a change in composition of life there, not the end of life. Yes, birds that prefer tall trees can no longer thrive when those trees are blown down, but birds that like low growth will increase their breeding population. Unlike human destruction of habitat, natural events can cause productive transformation. The next time we here at Talkin' Birds hear about birds being blown around by a hurricane, we'll be concerned for the birds, of course, and we might even rush to see them if it's safe to do so. However, maybe we'll plan to visit that location in a few years and see how the entire picture has changed. How about you? We're all aware that this summer's drought conditions in several areas of North America are affecting agriculture. It is difficult for farmers to grow water-intensive crops such as walnuts and avocados without extensive irrigation, often by importing water from less drought-stricken areas. Some crops, however, are affected less directly: thirsty birds that can't find water to drink are eating up moist crops. Here's an example: Fenton Farms, a small farm in Batavia, New York, has lost almost all its eight acres of sweet corn to birds, specifically grackles, starlings, and Red-winged Blackbirds. Owners Paul and Gail Fenton are accustomed to giving up "a couple hundred dozen" stalks to bird damage, but this year, all of their fields are devastated. Usually, the birds eat the field corn before turning to the sweet corn that's so highly prized by farm stand shoppers. However, this year the field corn suffered so badly from the lack of water that the birds had to turn to the sweet corn instead. These troubles aren't occurring only on Fenton's farm. There's been significant bird damage to crops all over North America. A shortage of sweet corn for human consumption is a small effect of drought. But the drought has a much larger effect on birds. For example, birds that are forced to find water on farms can face dangers there—such as mowing—that they wouldn't face in their normal habitat. Birds crowd one another at watering holes that are smaller or fewer than usual, increasing the spread of illness. Birds that eat insects will find less food when water levels are low because fewer insects will hatch. What can we do to help? Well, aside from getting involved in local water policy and taking measures to conserve water, we can make more water sources available to birds. Bird baths and water features in our yards help, as does putting out moist food such as fruits and vegetables. Cleaning up local waterways, no matter how small, can make the difference between a good habitat where birds will congregate and a bad one that they'll pass on the way to the cornfield. So next time you wish you saw sweet corn at a farm stand, maybe you won't mind as much if you think about the thirsty bird it nourished. Then support the farmer: buy the tomatoes and peppers instead.